Time flies so make the most of your minutes. 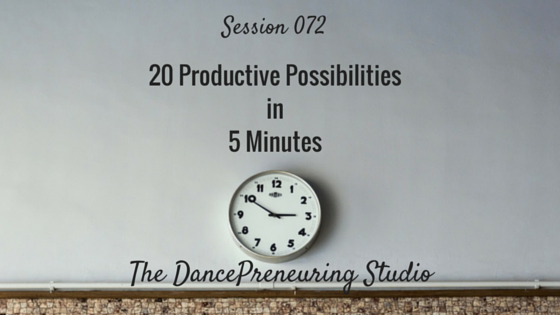 In this session of The DancePreneuring Studio, I share 20 productive possibilities in 5 minutes that will improve your day. 1. Planks. Check out this plank challenge you can do. 2. Short HIIT workout. I use the Seconds Timer on my iPhone to time and guide my workouts. 3. Find some new music for your workouts or if you’re working on teaching or choreography. 3. Update your to do list and assess if what you’re spending your time on is important. 4. Close your eyes and meditate. 5. Play some ambient music and spend time in stillness. 1. Unsubscribe from material that you’re no longer reading or no longer helping you. Check out unroll.me to help you manage your emails. 2. Respond to a few emails buy ciprofloxacin online that you haven’t responded to. 3. Read for 5 minutes whether from a book or catching up on articles on Pocket or Instapaper. 4. Return a phone call. 1. Start or update your vision board, whether online or offline. 2. Listen to or watch a TED talk. 3. Set a timer and list as many exciting places you want to visit and things you want to do. 4. Color or paint. Check out this coloring book for adults. 5. Improv movement or song. Question: What productive thing can you do in 5 minutes?